Life is challenging, yo. Let’s keep it real, shall we? It’s easy to paint a perfect picture of your amazing marriage and well behaved children and super rewarding career. But what goes down when no one is looking? The reality is that even the most amazing husband can be slightly annoying at times (and slightly more than slightly, at other times). The well behaved children are not always well behaved and the rewarding career not always the life of a rock star that you had dreamed about. After an especially challenging week of coming home to dishes and homework and annoying husbands and misbehaving children, you just feel like throwing in the towel and saying all the negative words you can think of! 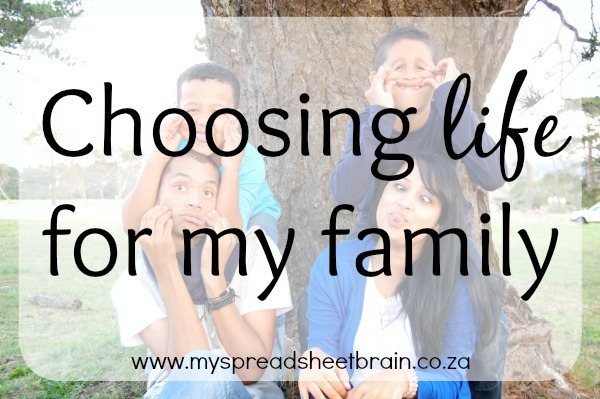 But I’ve learnt that choosing life for my family is a daily decision. What does “choosing life for my family” even mean? Well, I saw this message this morning and it totally says everything that I can’t: Women can make or break the attitudes of our homes. Let’s build our houses with the knowledge of God that changes our behavior, the wisdom to communicate this knowledge to others, and the understanding to live out our faith. Because “charm is deceptive, and beauty is fleeting; but a woman who fears the Lord is to be praised.” Proverbs 31:30. The amazing thing about God is that He has given us freedom of choice. We have the power to choose what we allow into our lives and into our thoughts. We choose how we react to situations and how we speak to people and make them feel. We choose what we release into the atmosphere. And sometimes we need to guard our hearts and our mouths – especially at home yo, when we’re not wearing the masks we put on to face the outside world. Home is where we’re most comfortable and often the most unaware of how we’re affecting the atmosphere. I was just thinking that with the heinous amount of crime (even the small stuff) that takes place on a daily basis, it is so easy to become a statistic. It’s something we do our best to guard our family against. We put up security fencing and gates. We install alarms. We take out insurance policies. We take ACTION to guard our families against the “enemy” outside. But what about the “enemy” that we allow inside? How often do we guard our family against negative words and actions? Things like what I’m saying in front of my kids and what I’m allowing them to watch on TV. What are my children seeing me do? What are they seeing me NOT do? How do I handle conflict, in my home? As the mother of my household, I try to stay aware of my attitude and decisions knowing that it directly affects my kids and husband. I mean, I’m no super hero, but choosing life for my family means that I want to TRY to be the best I can be for them. Today, I am challenged to choose to speak life over my household. I am challenged to not entertain anything that would hinder their growth. How about you? Will you choose to be a light, wherever you are? I dare you.